How old does my child need to be to take trumpet lessons? Brass instruments require strength. Most students will do well at the age where they would be able to lift weights. That's usually around 11 or 12 years old, but not too much before. Students can start earlier, in some instances, but the lessons would be repetitive until they were able to get their strength up. A lot of students between the ages of 10 and 14 get braces. While it's not impossible to play the trumpet, it does make it slightly more difficult. At Southern Park, we are accustomed to teaching students with braces. Keep in mind that options such as Invisalign, or invisible braces that go on the inside of the teeth, are great options for trumpet playing! My child already plays his/her instrument in the school band. Why should s/he take private lessons? 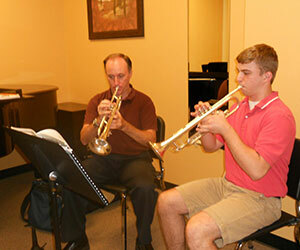 Band is a great way for students to learn the basics of their instruments and have some fun doing it. Quite often, however, bad habits can present themselves and then become a way of playing. Private lessons at Southern Park are designed so that each student gets individual instruction, helping the student reach his/her true potential. Where can I purchase or rent a trumpet?